Cosplay is a hobby and lifestyle in which fans of TV, film, comic books, and other types of genre entertainment take on the guise of their favorite characters. This is a serious subculture with its own rules, stars, and fans. Some cosplayers are professionals who travel to conventions around the world where they are paid by the event organizers to add a bit of “realism” to the fan experience. Other cosplayers are amateurs who make their best effort, often succeeding more in spirit than accuracy, to channel their favorite superheroes and fantasy characters. The latter make do with what they have—spandex is a substitute for body paint; plastic capes stand in for leather; costumes purchased off the rack are used because hand-crafted ensembles are prohibitively expensive. By comparison, professional cosplayers are dedicated to their craft and no expense is too great because accuracy overrules all other concerns: they quite literally become the character(s). The amateurs know their place relative to those folks who cosplay as professional vocation. They are second fiddles, pretenders, and mere hobbyists. 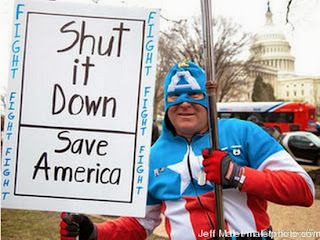 The American people are now held hostage by the Tea Party Republicans, who in an act of protest against expanding human rights to include health care, have shutdown the U.S. government. This group of political thugs also have a love of costumes. As the American people have seen on numerous occasions since their rise in 2008, the old white men who flock to the Tea Party are enamored with George Washington, Thomas Jefferson, and those others who are loosely considered the “Founding Fathers” or "Framers" of the United States of America. 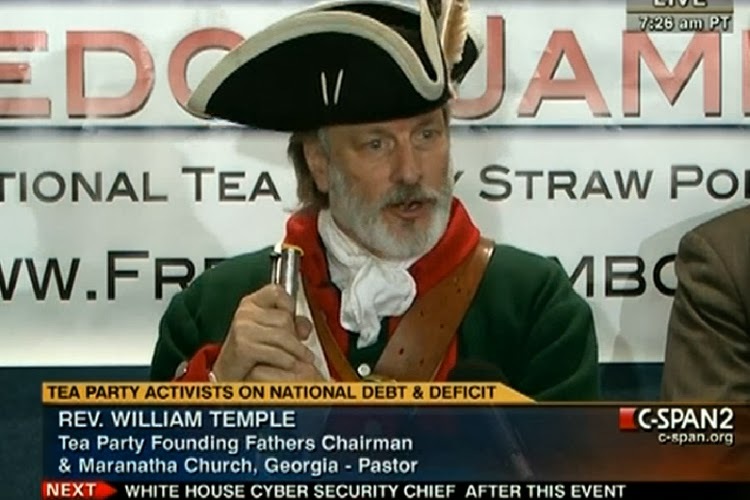 By analogy, the Tea Party GOP consists of amateur political cosplayers. Professional politicians understand the importance of building relationships, consensus government, and of nurturing alliances across the political divide. Moreover, serious elected officials are not interested in destroying the very social and political institutions which make governance and serving the Common Good possible. The Tea Party Republicans are the cosplayers at a convention who go to Walmart to buy a costume, but think it is authentic and real. They find a character to become, but they know nothing of his or her origins. The costume just looks "cool" to them. As is true for many of us who seek out a superhero or mythology to identify with—be it Ayn Rand, Ronald Reagan, Spiderman, or Che Guevara—the quest is one of projection and yearning. Ultimately, we want to see ourselves in this hero as a way of giving meaning to our own lives, even if in actuality said hero does not represent or embody what we wish them to. The Tea Party and its members are beset by many delusions and misunderstandings of empirical reality. They are not a “grass roots” organization. The Tea Party is funded by the plutocrats and the 1% through the Koch Brothers. They would like to believe that the “American people” support their seditious and treasonous efforts to subvert the United States government, as well as its legitimacy under the country’s first black president from within. In reality, the Tea Party and its policy positions are very unpopular among the American public. Most importantly, the Tea Party, with their costume fetish, would like to believe that they are continuing the struggle of the “Framers” against “tyranny”. The Framers of the United States were elites. As a group, they included the richest people in the country. Consequently, the Framers had a profound concern about the perils of mass democracy and how it could be subverted by the passions of an overly emotional and easily manipulated public. In all, the Tea Party are the very rabble that Jefferson, Madison, and others warned us against in the prescient and genius Federalist Papers. Specifically, the Tea Party Republicans are a 21st century example of the tyranny of the minority that Madison identified as a threat to representative democracy in the Federalist Papers 10. His words are as true now as they were centuries ago. If the Tea Party Republicans were serious political cosplayers they would know their canon: in fact, they are the very people who their supposed heroes would have spat on and then run out of town as threats to the republic. And who would have though that American exceptionalism would be undone by a group of costumed clowns with a fetish for “the Framers” and a twisted interpretation of the Constitution? One of the two major governing parties in the United States is now overrun by political cosplayers who wear the uniform and the garb, but who have little understanding of the best legacy and creed which they are channeling. The adults in the Republican Party must explain to the political children who are the Tea Baggers that the time for dress up playtime is now past. Of course, such a thing will not happen in the near term. The Republican Party is controlled by political children who are able to bully, cajole, and intimidate their parents. The Tea Party is a group of cantankerous and imperious brats. The American people are made to suffer by the political theater gone wrong that is the Republican Party in the Age of Obama, and how the adults in the GOP have surrendered to their poorly behaved children. Shame on them, it is the parent who is to be blamed for a child’s bad behavior and not the other way around. It is time for a spanking. The Republican leadership is unwilling to dole it out. Thus, the American people are made to suffer and hurt. I am a long time reader but this is my first time posting anything. Honestly, I am a little intimidated by your posts. Sometimes I have to go to google a couple of times to find out what words mean but I felt every word of this post. It was definately a different take and spin on the shut down but I think it hit the nail directly on the head. Very nice. Hear, hear! Every word is true. How kind. Do comment more often. Intimidate? Then I need to work on clarity in writing. Good suggestion. I like "hear, hear!" It is a phrase we don't hear enough, that one along with "bully!" too. I think we should try to bring them back. I would like the media to start calling this out for what it is, and as you wrote--"seditious and treasonous." These people are so deluded that they would rather see our country fail and people suffer. As I looked at television, watching mostly older, white men, I shook my head and rhetorically asked: My God, What kind of country do we live in? Absolutely spot on, every word! About that "undoing of American exceptionalism": I wonder what the clowns might be thinking, if they are thinking at all, about the "credibility" of the United States that so many of them were wailing about just a couple weeks ago. Two other bits of the many I have read today that are also quite good: Charles Pierce's of early today: http://www.esquire.com/blogs/politics/Shutdown_Blues and also, Rachel Maddow: http://video.msnbc.msn.com/rachel-maddow/53151808#53151808 she showed clips of Republican House members coming out of their caucus meeting the other day and they were GLEEFUL that they were going to shut the government down. Clowns indeed! What I don't understand is that there are a few longer-serving, saner Republicans around (not that I agree with their policy positions, but they are smarter than this) who are going along with it. My own house rep, Tom Latham, is one of them. He is in a new district that includes Des Moines and I can't imagine this is going to play well here. If a couple dozen of them would break ranks, this could all be over. Going along with the tea partiers is not going to help him here in 2014. The sane Republicans in a perfect world would start a 3rd party or a caucus within their own party to counterbalance the tea party brigands. We need good healthy responsible political parties to balance one another. The Tea Party GOP are so short-sighted because in destroying their own party they are creating the circumstances necessary for the type of "liberal" politics they abhor. Being old and white and male ain't the problem. The crisis here is that of a group of right wing authoritarian radicals who are willing to destroy the country's governing institutions. I just discovered this blog and I love it! Well we just discovered you. Do keep reading and commenting. "f the Tea Party Republicans were serious political cosplayers they would know their canon: in fact, they are the very people who their supposed heroes would have spat on and then run out of town as threats to the republic." It's nice to hear accuracy about American history. Often, as these Tea Party members do, people will elude to history to justify their position, but don't recognize the reality of what was really going on. I'll be around. Nice to meet you Chauncy DeVega. My name is Bryan Ortez (I prefer to be myself than to try to be anonymous).